I did some part time fill in work at my old job last week and Ben & Jerry's flavors happened to be a major topic of discussion. Why, you ask? Because it was 4:00 on a Friday and these are the kind of filler topics that come up when everyone is ready for the weekend! Lucky for me, it was a conversation I could add some serious input to! As I deeply contemplated my favorite flavor, I knew there was no match for Ben & Jerry's Half Baked ice cream. Have you ever had it? If not, you must go try it immediately. They even make it in a Lo-Fat version, so I don't want to hear any excuses out of y'all. Chocolate and vanilla ice creams studded with fudge brownies and gobs of chocolate chip cookie dough. I mean, really??? Wow. Dear Ben & Jerry: you tryin' to kill me? Love, Melissa. 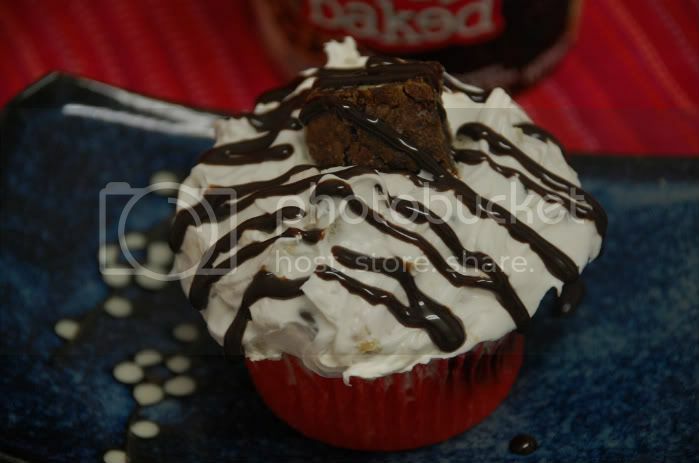 So, in honor of this fabulous flavor, I decided to create a cupcake version of Half Baked. 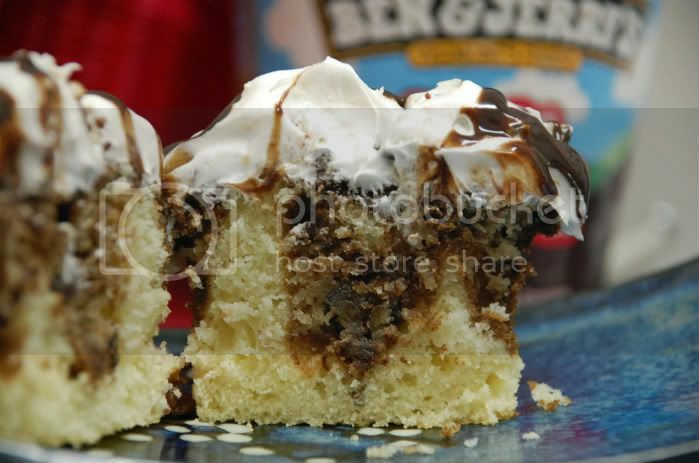 At least with this creation, I could take my time to savor and not worry about the melting factor :) Here's what I came up with: swirled vanilla and chocolate cake studded with chocolate chip cookie dough, topped with a chocolate chip cookie dough whipped cream frosting with a brownie chunk and chocolate ganache drizzle. Yep, this reenactment definitely did the trick. I used King Arthur's choco-nilla cake recipe for the actual cupcake (so delicious and super easy). I only made a few of these so the rest of the recipe was used to make a 4 layer 6 inch birthday cake which is featured above. -Use any brownie recipe you prefer and cut up into 1 inch chunks. I used Dorie Greenspan's Katherine Hepburn brownies. 1)Whisk together the yogurt or sour cream, eggs, sugar, salt, baking powder, vegetable oil, and vanilla. 2) Stir in the flour, mixing till smooth. Drop in little bits of cookie dough. 5) Remove the cake from the oven, and after 10 minutes turn it out of the pan onto a rack to cool. 6)Whisk together the dry ingredients. 7) Add the eggs, oil, and vanilla, beating until smooth. 8) Gradually add the water, beating until smooth. Drop in little bits of cookie dough. 10) Bake the cake for about 35 minutes, or until a cake tester inserted into the center comes out clean. 11) Remove the cake from the oven, and after 10 minutes turn it out of the pan onto a rack to cool. 12) Divide the cooled cakes in half horizontally, to make four round layers. Place one vanilla layer on a serving plate. To make the frosting: in a medium bowl beat the whipping cream until stiff peaks form (do not overbeat); set aside. In a large bowl, combine cream cheese, sugar, salt, and vanilla. Beat for 2 minutes until smooth. Fold in the whipped cream. Fold the remaining cookie dough chunks into the frosting and immediately frost the cooled cupcakes. Drizzle chocolate syrup or ganache on top and use a brownie chunk for garnish. Wow! This looks SO delicious! Thanks for sharing!